evergreen shrubs : My love affair with J.R.
You can return to our evergreen shrubs page or browse the pictures using the next and previous links. If you've found inspiration take a look at the shrubs section in our garden centre. My love affair with J.R.
Underneath Garrya elliptica "James Roof" ~ J.R. In my garden 21st February 2009. His tassels have grown longer since his New Year photo. I confess ~ I'm in love with J.R.
Nice shrub with lovely catkins. Mine doesn't seem to have anywhere the number of catkins this year as it normally has. Those it does have are still very nice. Hi Toto ~ Do you think your JR is having a "rest year" ? In 2008, my Clematis Armandii had almost no flowers, but there are lots of buds on it this spring. The sun is shining on JR right now. It could be TT. It looks healthy enough, just few catkins. I call them "tassels". Lol. Sounds good to me. they certainly look like tassles. How tall is JR, TT? Looks very pretty. Those top tassels on JR are probably about 7ft from the ground. He has another l ft of new growth above that. I might try making some cuttings. It would be nice to have JR's babies. Lol. This is just fabulous, no wonder you are in love with it and hankering after babies too! Fantastic plant. I saw a very impressive one in a nearby garden recently. So different to other plants! Yes, JR " grows on you ". When I first acquired JR wasn't sure about him. I wonder if the wet summer last year suited JR.
Amy ~ what do you think about that idea ? I think you could be right TT , the other thing I have noticed is that normally the leaves have been blackened by the frost which dosn,t look very nice and takes ages to grow out , so far this year despite the frost and snow the leaves look good , it will be interesting to see if it,s the shock of the late unexpected frost that do the damage . we will see ! Yes, we will see ! I'm so glad I planted my JR not that far from the back kitchen door, because I can admire him each time I go out into the dog run... which is very often with Truffle the puppy. Lol. Is he use to his run TT , does he like it , or does he try to stay in with you ? Amy ~ the run is a good place for Truffle except the edges are shingle and I can't leave him unsupervised in case he swallows stones ! It will be fine when he is a bit older. So my gardening is a bit restricted right now. Lol. Beautiful plant. Can fully understand your love affaire. You can,t be to careful TT . it was only yesterday that I was reading about Strange happenings in Golf , one story was that a man who lived near a golf green was taking his dog for a walk and could hear a strange rattling noise coming from the dog , he took it to the vets who found 13 Golf balls inside it , these stories are suppose to be true ! Beautiful J.R. no wonder you are in love with him TT! I can well understand your infatuation. Would JR survive in BC or would he be too cold ? I'd love to have one growing in my garden if possible, I can sense the feeling TT!!...LOL.. :-) Beautiful! Yes, I have special feelings for JR. I pick up Truffle the puppy, and show him JR's wonderful tassels close up. Lol. What does Truffle think of the tassles ? JR now towers over the dog run. He watches over Truffle, who is VERY impressed by his tassels. I'll try to take a photo some time of the dog run with JR alongside. I'm sure JR feels the same way about you, TT? I saw another one of these (on my travels) today Tt and it was absolutely huge! I think you might need to do a bit of pruning in the future unless it's got plenty of space around it. I reckon many JR's put on extra growth with last summer's rain. and Dotty, you could have his babies. Lol. OH-er underneath him aye! lol lovely pic TT, he is stunning i can well see why you are besotted. When do you think is the best time to trim him, please ? Hello Teratoonie, Very beautiful ! I see catkins of the shrub first. I heard sometime the shrub produces both female and male catkins, Really ? Which are they in your photo ? Can I see another catkins ? And then, thanks you for your comment on my website. Thanks Tsuyoshi and Maj for your comments and advice. I'll ask a member with further experience of JR to add more information to this thread. 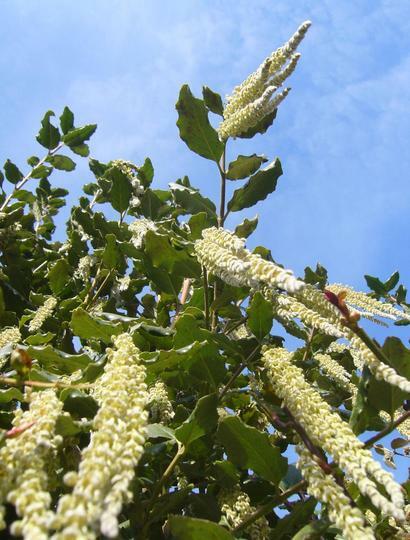 Hi TT Garrya ‘James Roof ‘ also known as silk tassel bush is a strong vigorous male with large leathery leaves and extra long silver catkins up to 20cm long. It grows up to about 4m tall. Generally speaking you should not need to prune Garrya but any dead or unwanted growth can be removed in April or May. It’s not a fussy plant and will grow on the poorest of soil as long as it’s well drained. Tolerates either full sun or partial shade, very good on a north-facing wall. It is salt and pollution tolerant so would cope well in a coastal or city situation. Garrya elliptica has both male and female plants. The female has long clusters of deep purple-brown fruits. Thanks so much for your information. You've answered lots of questions. Do you grow JR in your garden ? I planted JR southfacing, because I wanted him not far from my back door. But I make sure he doesn't go short of water at the roots in the summer. All that rain last year really suited him ! Today, JR's tassels are blowing about a lot in the breeze. A pity you are in such a very cold zone, Gilli. JR seemed not bothered by all the ice and snow in my garden. His tassels stayed intact. You can see in my new year photo they were shorter, then the photo above after those weeks of snow and freeze. Still looking handsome. Hi TT No I have not got any Garrya at the moment although I did have a Garrya 'pat ballard' it had to come out to get the greenhouse in:O( it's now in my sister's garden. There's a coincidence ! I just googled Garrya "Pat Ballard" for good photos and it came up with UBC Botanical Garden, Botany Photo of the Day for January 8th 2006. Some lovely pictures. Glorious tassels ! Lucky sister to win that Garrya. Maybe you could take cuttings ? It was nice to have some blue sky to photograph :o). I can see JR's tassel size has increased tremendously TT. My goodness, if they grow any bigger you'll be tripping over them. trying to cram in too many plants ! It is a stunning plant TT. I had one many years ago at a former home but never got to saw it in its full, mature beauty - must get another! Yes, I honestly do feel passionate about JR. Dawn ~ JR would look good in your gardens. Islander ~ JR survived the ice and snow very well. Your JR is looking good. Very beautiful tree and photo! How tall is this tree? JR is very special to me. I talk to him every day. He watches me train the puppy. JR appears to be much taller in your photos...I thought JR might have been at least 20 feet / 6.1 meters tall. The Royal Horticultural Society mentions JR growing to 12 ft. It is an important plant at RHS Rosemoor, North Devon. JR grows against the Visitor Centre wall to either side of the main entrance, and is therefore one of the first plants the visitors see. RHS says that JR's tassels are a wonderfully welcoming sight on a cold winter's morning. the wind froom the seas carries salt in it and we get lots of wind, that is the problem growing trees etc here, the winter temperatures are usually better than the mainland that is why I doubt the ability to grow jr here. How is truffle doing? RHS Rosemoor says that JR is well suited to coastal conditions and tolerates pollution. I guess JR would be okay in the Orkneys if in a sheltered position away from fierce winds. Conker the Sheltie is so very kind and patient with him. Lassie is doing o.k. we have got a male Lab with her at the mo, hoping to make puppies. she always refused to allow any dog before but she seems to like this one so its fingers crossing time. will let you know in 4 weeks time if she is expecting. That's encouraging news about Lassie ! Sorry I couldn't fit Orkneys on the map I uploaded. Lol. I would like to have one of these eventually. I can see why you are in love. Very nice! I'm trying to grow JR Jrs, in other words, JR's babies from cuttings... not yet sure if it is going to work !!! Good luck, Oji, with your JR. He should be okay in a sunny, sheltered position. His tassels make a lovely show through the winter. Yes, I've also acquired more evergreen shrubs. Helps to make the garden look interesting all year. Wow! That is gorgeous. No wonder you love JR. It was love at first sight for my OH and JR. How lovely that you managed to grow some from cuttings too. I will need to try that.